TORONTO - Toronto Mayor Rob Ford has put his name on the ballot to run for another term, defying repeated calls for him to step down after admitting he smoked crack "in a drunken stupor." Ford was the first candidate to show up at City Hall when registration opened Thursday for the city's municipal election Oct. 27. He promised "Ford more years," the Toronto Star reported. He also called himself "the best mayor this city has ever had." "If you want to get personal, that's fine," Ford told reporters, according to the Star. "I'm sticking to my record, and talk is cheap. You're going to see action like you've never seen before." He was more restrained on Twitter, tweeting a photo of himself signing up to run again and saying simply, "Just filed my paperwork for the 2014 election. Vote on October 27th." The conservative mayor of Canada's largest city has said he would run again, even after the revelations last year about his drug use pushed him into the international media spotlight. The Toronto City Council has stripped Ford of most of his powers, but he continues to receive support from some in the city's more conservative suburbs. He first won as mayor by promising to "stop the gravy train" of government spending. Reactions were swift but mixed Thursday after Ford signed up to run again. "That pathetic excuse for a mayor should get the hell out and stop embarrassing this beautiful city," said Inna Evtoushenko, 36, a Toronto resident. Derek Killins disagreed. "Other than embarrass the hell out of himself and the city as a public figure, has he done anything pertaining to his job that was detrimental to the city's well-being from a financial or economical standpoint?" the resident of neighboring Waterloo said. "Most people I ask say that he's done a good job for the city otherwise." The wiretaps are evidence in the case against Ford's friend Alexander Lisi, who faces trial on drug and extortion charges. The mayor has not been charged. "It's too early to tell about Ford's chances," said University of Toronto political science professor Nelson Wiseman of the upcoming election. 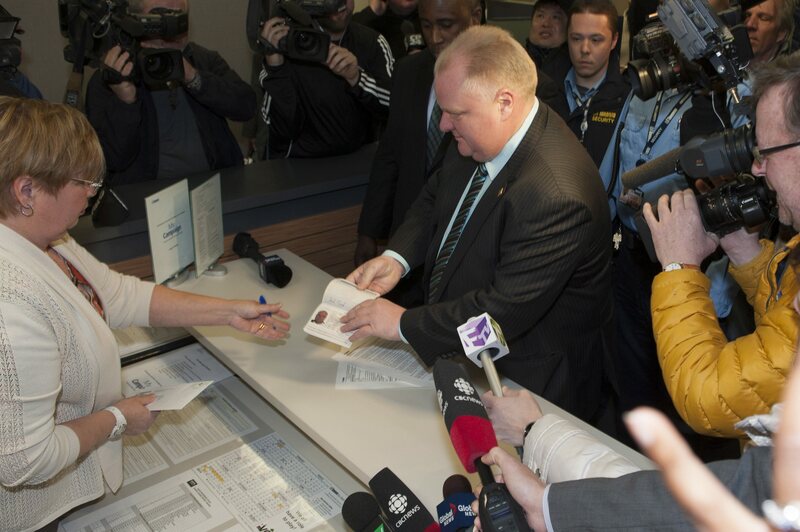 "Ford's more immediate challenge is whether the police charge him before the election. If they do, he's toast. If they don't, the outcome depends on the vote split. "I do not believe Ford will win more than about 25 percent of the vote whoever his opponents are. It is possible, however, to win with under 30 percent, depending on the vote split." The Toronto police investigation remains active. "There are still some matters that are being investigated and pursued," Police Chief Bill Blair told The Globe and Mail last week.